This is still one of my very favorite books. It's a rare candid MAN'S account of struggles with a horse that wouldn't comply with traditional riding and training. 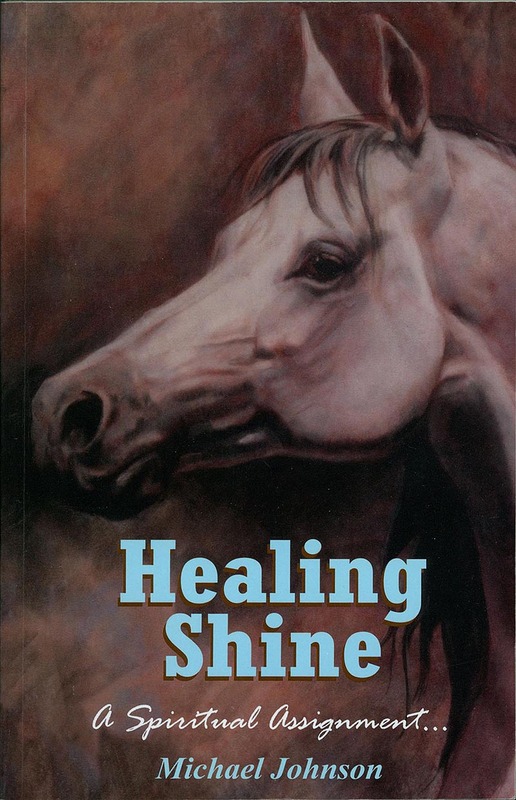 In it Oklahoma Cowboy Michael Johnson shares a great deal of the inner dialogue that he has with himself surrounding his struggle with the "flighty, spooky, special needs, mentally challenged" horse - Shine. "Long solitary conversations in the barn were the norm for me in those days, sometimes with the dog - but mostly with my self. I considered options, weighed angles, and most of all, wrestled with that internal voice we find inside us all; the one when someone else asks about, we deny knowing. "What?" we say. "No, I don't talk to myself; that's what crazy people do." I admit to hearing mine, and also that not only did I hear it in that barn, but we argued constantly. Then, to my surprise, I found someone - or something else - in there. I talked to myself all right, but at some point, somebody else butted in. Something - something more than me - started talking too. And by the way, what is that "thing?" That internal voice we all share our innermost thoughts with, that sparring partner we tell things we tell no other. Is that our "self" or is it the Spirit? Is that Jesus, and does he know where Idabel Oklahoma is? Is that voice the "Comforter" He promised to send? Be it guardian angel or deceased ancestor looking down on us from above, I have no idea - not a clue. "Best way is - you do it!" ...whatever had lit on the shoulder of my mind just didn't understand. The reason I was in this fix with this horse was due to my lack of knowledge. So why on earth did the answer keep coming to me that somehow the solution was in me? That was impossible." "You are like all the rest. You pray for great horse. You say, 'Oh, please give me great horse.' Get one, and what do you do? You say, 'Oh, he's crazy, I can't handle him, I need help, send him to someone else.' HEY! Are you listening? We didn't send him to someone else! We sent him to you!" On the other hand, Michael received plenty of advice from EXTERNAL voices, too. "Wet saddle blankets are all he needs." "Guarantee you a good ten-mile lope everyday for a week would solve most of your problems." "Hell, just rope on him. All that psychology stuff is messing up your brain. Just rope on him." "Why don't you find a horse that has some sense and will just let you rope and enjoy yourself?"